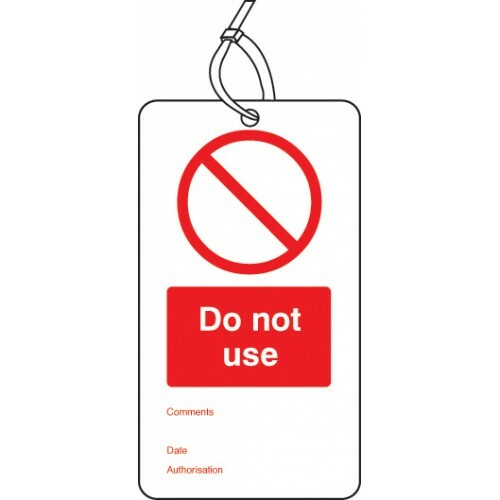 This double sided safety tag reminds staff that items should not be used. Lock Out Tag Out (LOTO) safety signs advise employees of potential dangers. Using the LOTO procedure ensures that dangerous machinery / equipment are properly shut off and not unexpectedly/accidently .. This double sided safety tag reminds staff that a machine should not be started up. Pack of 10 Supplied with 150mm nylon cable ties Miscellaneous Products / MaterialsAny product outside of our standa.. This double sided safety tag warns viewers that specific pieces of machinery should not be started when lock out tag out devices are in place. Pack of 10 Supplied with 150mm nylon cable ties Miscella..